1. Deseed and chop the red pepper and place in a blender along with the cucumber, garlic clove and salad onions. Blitz until broken down. 2. Add the tomatoes, basil leaves, olive oil and red wine vinegar and process until smooth, adding a little water to loosen if necessary. Chill. 3. Grill the bacon rashers until crisp. 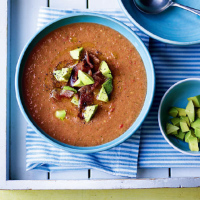 Chop up and serve scattered over the soup, along with the avocado.